By means of a telescopic photometer measurements were made in daylight of b, the brightness of a large approximately blackbody at a distance d=3.2 km, and of h, the brightness of the sky just above the blackbody. For visual ranges v from 3.2 to 15 km the measurements agreed with the theoretical relations v=(1/β) log 1/η and β=(1/d) log (1/(1−b/h), where β is the atmospheric attenuation coefficient, and η is the threshold of brightness contrast, being 0.02 for the usual intensities of daylight illumination. It followed that the ratio of β to the attenuation of optically pure air was 277, 55.4, 27.7, 13.8, 5.54 and 2.77 for v=1, 5, 10, 20, 50 and 100 km, respectively. 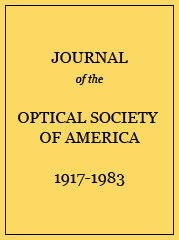 The angular distribution of light scattered by haze was determined in two ways (1) by measuring the brightness at various angles of a searchlight beam at night, and (2) by measuring the brightness of the horizon sky at various azimuths for a moderately low sun and a cloudless sky. The distribution was much the same for haze ranging from thin to thick. It showed pronounced forward scattering, over three-fourths of the light being scattered in a forward direction and less than one-fourth in a backward direction. Such a scattering distribution would occur from haze particles of various sizes, most of them being of dimensions greater than the wave-lengths of white light. Visual range and related quantities. International visibility code and atmospheric attenuation. β per km, Nat. Log.